Nathaniel Cooke Mammoth Ivory 1849 Chessmen. 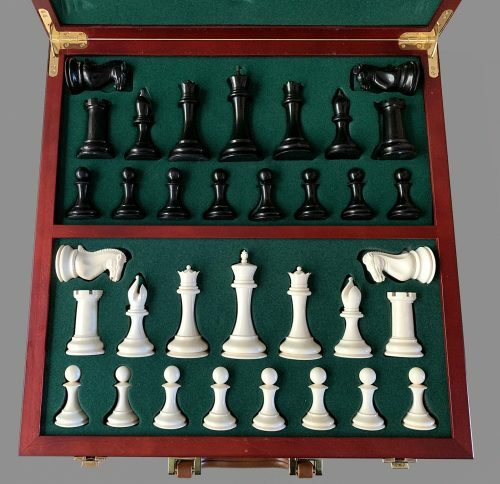 This reproduction is a set of Mammoth Ivory 1849 Chessmen, recreated by noted Staunton authority Frank Camaratta, and offered by The House of Staunton in 2001. 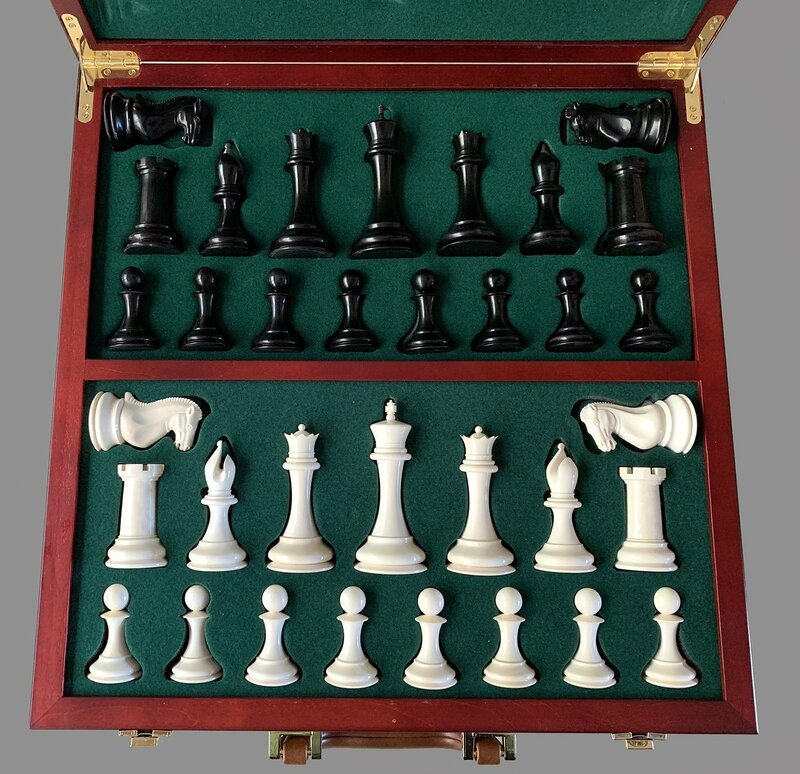 Crafted from 20,000-year old natural and black-stained Woolly Mammoth Ivory, the pieces capture the exquisite design and proportions of the original Staunton pattern Chessmen, registered by Nathaniel Cooke and produced by Jaques of London in 1849. 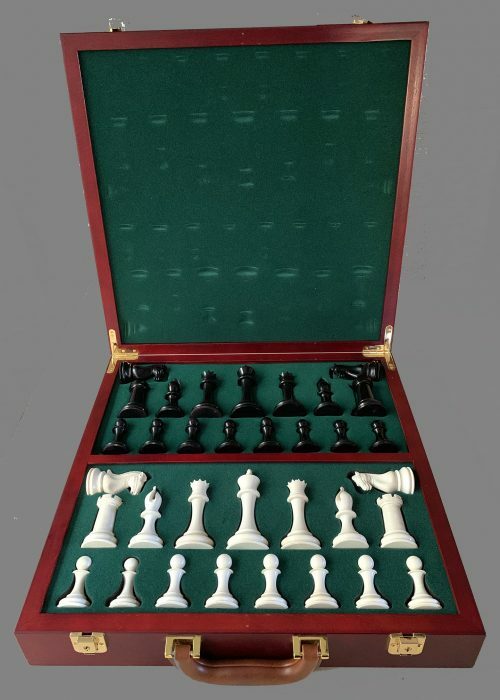 A full Club-sized Chess set, it features a 4.4″ King with a 2.0″ diameter base. Mammoth Ivory is a naturally dense material that does not require additional weighting. The Mammoth Ivory 1849 Chessmen were hand carved by master carver Igor Astafiev. 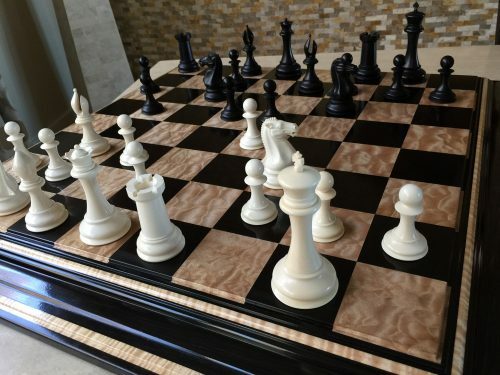 All 34 Chess pieces are crafted from the highest grade of Mammoth Ivory. The dark army has been stained the perfect shade of matte black. The chess pieces do not have base pads, but rather are left uncovered as has been the praxis for ivory chessmen over the centuries. The chessmen are housed in a luxurious, fitted mahogany briefcase especially designed by Frank Camaratta to protect these heirloom quality masterpieces. 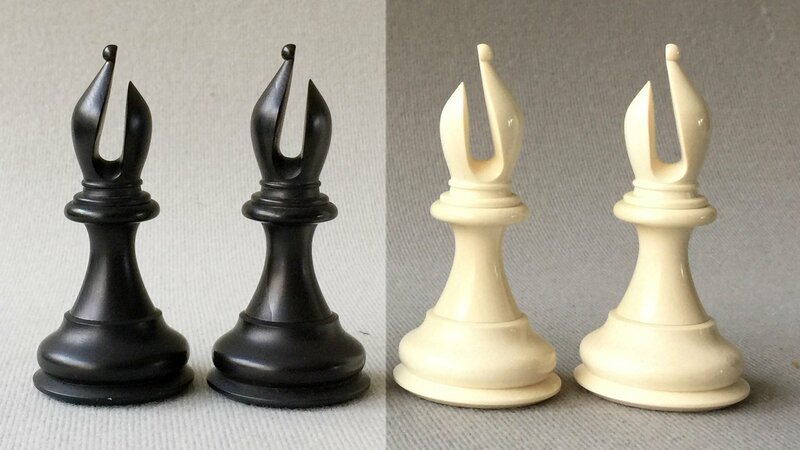 The Mammoth Ivory 1849 Staunton Chessmen consist of 34 Chessmen, including four Queens, an innovation introduced by Frank Camaratta in 1993 which has now become a World-wide standard praxis. The chess pieces and briefcase are as new. 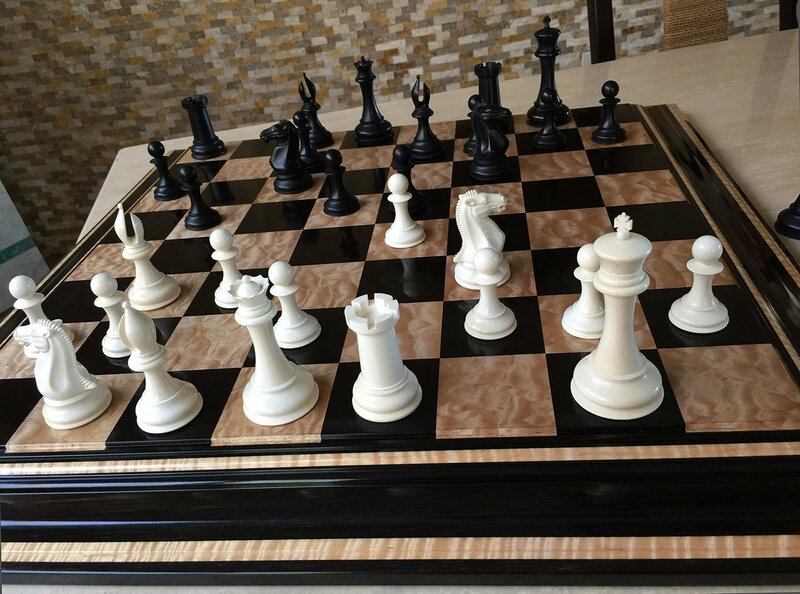 The chess pieces play and display best o a chessboard with 2-1/2″ squares. The chessboard shown is not included in the sale. For a complete selection of our finest new and antique chessboards, please click here. An extensive inventory of antique and contemporary chess timers can be found here. 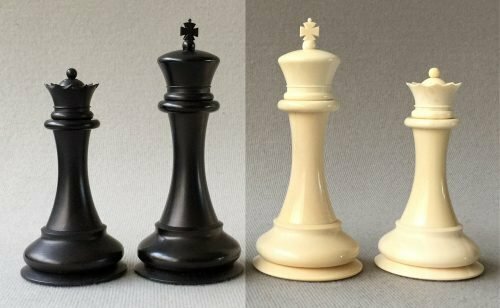 For a short history of the John Jaques Company and the Staunton Chessmen, click here. History Of The Chess Pieces. The Mammoth Ivory is excavated from the permafrost of the Siberian tundra, which the woolly mammoth inhabited for more than 160,000 years. 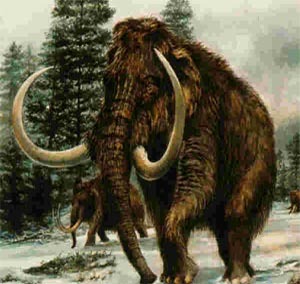 During the last ice age, the mammoth went extinct as the direct result of rapidly plummeting temperatures. The dry, cold environment of Siberia combined with the massive sheets of ice from the ice age created the ideal environment for the preservation of Mammoth Ivory. The woolly Mammoths have been entombed under the Siberian permafrost ever since, waiting to be unearthed. For more than 2,000 years, Mammoth Ivory has been traded and it remains a highly prized commodity across the world. While that demand for the Mammoth Ivory has always been higher than its supply, it began its steep rise when the international ivory ban was enacted. This agreement banned all sales of new Elephant or Walrus Ivory, in an effort to protect the animals from extinction. As a result, Mammoth Ivory became the only type of animal-based ivory that is exempt from the international trade restrictions. Over the past few years, the price of Mammoth Ivory has more than tripled, due largely to the unprecedented demand for luxury goods from such emerging countries as India and China. This trend is expected to continue. Less than one percent of the Mammoth Ivory harvested is of suitable quality for the manufacturing of Chess pieces, thus adding the production costs and long-term value. The Mammoth Ivory 1849 Staunton Chessmen exemplify the perfect combination of distinct beauty and balance. 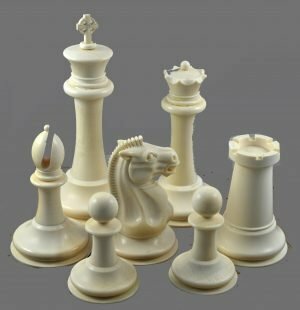 The design, accuracy, quality and craftsmanship of Mammoth Ivory 1849 Staunton Chessmen is UNMATCHED by any set of Chessmen at any price. Nothing even comes close! Lot #445. Imperial Mammoth Staunton Chessmen.